Getting a larger budget from the school is not an option. There is no discretionary or R&D budget. What is the most sustainable way for Mr. Farber to solve this problem?A. Pay the $184 difference out of his own pocket. B. Keep printing tests as normal, hoping the $184 would be found somewhere between now and then. C. Reduce the number of tests. Use up only what his budget allows, possibly sacrificing the course’s effectiveness. Assuming his methods really are effective, give Mr. Farber extra credit for choosing “D” and refusing to sacrifice the quality of his students’ education. When faced with the prospect of a budget shortfall, Farber invented a way to make up for it. The managing director of Commercial Alert, an organization formed explicitly to prevent commercial interests from intruding on spaces they deem ought to be impenetrable, is worried that, since Mr. Farber raised nearly twice as much as his shortfall, this feat might be duplicated by other struggling schools. Do Mr. Farber’s extra tests make the course more effective at teaching Calculus? Can that effectiveness be duplicated by some other means, less expensively? Does selling any ad space, whatsoever, in any format, inherently corrupt the education process? Do ads inherently corrupt the students? Is it possible to corrupt students with advertising? What measures can be taken to prevent it? When are sponsored ads on tests justified? If the answer to #1 is yes and #s 2-5 are no, then by all means, sell the ads and let the kids learn. If the answer to #1 is no, then it doesn’t much matter what the other answers are, because the problem isn’t with the number of tests, but with the teaching method. If the answer to only #1 and #5 are yes, then it becomes necessary to answer #6 and to determine which option costs less: Forking over the dough for copies or investing the time, energy, and money to institute proper safeguards that prevent the corruption of the students or the process. Who is responsible for finding out? The teacher and the school have the duty to educate the children under their care. Thus, it is up to them to confirm the effectiveness and integrity of the system. Once they’ve established a positive correlation between number of tests and better grades, they can determine if the better grades were caused by another factor, such as some sort of quid pro quo between the teacher and the advertiser. The reasonable person is a legal fiction of the common law representing an objective standard against which any individual’s conduct can be measured. It is used to determine if a breach of the standard of care has occurred, provided a duty of care can be proven. The standard performs a crucial role in determining negligence in both criminal law—that is, criminal negligence—and tort law. The standard also has a presence in contract law, though its use there is substantially different. Therefore, if Commercial Alert or any other advocacy group believes the practice of exposing students to advertising is harmful in some way, they are obligated to not only assert, but provide a body of evidence that shows how what they claim could be true. It is incumbent on them to do so, because they propose such advertising be eradicated by statute, and in doing so they eliminate a potentially effective resource for overcoming budget problems in a way that doesn’t require compulsion. Because unlike individual taxpayers, sponsors have the choice as to whether or not they will participate. The standard of proof has to rise above the level of indignation – feigned or otherwise. Commercial Alert may have a point. But they may be blowhards. It’s up to them to convince the public which category they fall under. Likewise, Mr. Farber and his school shouldn’t get a free pass, either. We shouldn’t take on faith that his approach is necessarily better than one requiring fewer tests. But in this case, there should be a mountain of statistical studies already that suggest one thing or another. Age of Conversation 2: Why Don’t They Get It? was officially released yesterday. I bought both a hardcover and an electronic copy, and from that purchase, $16.04 is being donated to Variety, the children’s charity. 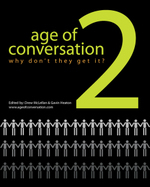 The Age of Conversation 2 contains different topics and different point of views about new marketing world. It is the second collaborative book published by Gavin Heaton and Drew McLellan. This book contains a lot of chapters and one chapter is of one page. The book is challenging the business groups just like trading robots are challenging the trading world. But that’s not why you should buy this book. Now, you know that as a contributing author, I’m biased, but having read a few essays so far, I know that the quality of thinking and writing is strong. As a contributing author to the first Age of Conversation (which is still on sale at Amazon), I can say without bias that this version is so much better than the first. The difference, I think, can be attributed to several factors. A dedicated theme. “Why Don’t They Get It,” as chosen by the community (including non-authors). Organization. Authors had choice of topics from within that theme. Authors chose between Manifestos, The Accidental Marketer (John Herrington’s chapter is in here), A New Brand of Creative (my choice), My Marketing Tragedy, Life in the Conversation Lane, Keeping Secrets, From Conversation to Action, and Business Models. Kudos to Drew and Gavin for stepping it up. Increased effort. Authors (including returning authors) knew the opportunity was serious. They stepped up their game for this one and unleashed their creativity. More perspectives. About 134 more authors this time than last. We’re all over the globe, too. While you’re making up your mind, here is some information that may help. Thanks to the great Kristin Gorski for the author formatting! A control also known as the widget is used to enhance the user interface. The widget is included in the software graphical user interface in the form of a scroll bar or sometimes in the form of a button. These are the components that are included in the software by using which the user can directly get to the page that has the information they want to read as well as can edit them. These are usually used to redirect to the apps. There are libraries which offer a lot of controls along with logical codings like Windows Presentation Foundation and cocoa. These are designed so that users can use their devices conveniently by letting them access information or accept something and respond by pressing the keys. When widgets are used in programming languages they are in the form of a small set of coding which explains how the design of widgets should be and what function should perform as well as after that function is executed how it should respond to the user. The application of widget world was done firstly in operating systems that used Unix and X Window system. In the programming language that uses object-oriented programming each set of coding that form widget is known as class. To simplify programming almost all the languages that are used to develop apps such as Java and tool command languages are taking the widget from the rack of widget library. If the designed widget does not perform or does not look like how the programmer wants it to be then they can modify some contents to get the desired functions like you can click on top10cryptorobots.com. When we want to refer to some object that is distinct the word widget is used. When programmers are talking and they have not given the name to that object or not able to recall the name of that object they make use of a general term widget. Since we cannot physically touch this widget they are known as virtual buttons that can be accessed using the mouse pointer. Copy and paste the text below to add this Age of Conversation widget to your blog. When I was a boy, sometime between 7 and 10, I lived with my family in Okinawa, a tiny island located in the Pacific. It seems like we were hit by one or two typhoons (basically a hurricane by another name) every year. Most of them weren’t serious. We just bunkered down, lit up the candles, and occasionally toweled up the water coming in under the doors. I used to stare out the window with my two older brothers and count the seconds between the flash of lightning and the thunder that accompanied it. In our third and final year in Okinawa, we were hit by probably the worst one we’d ever seen since we arrived. I seem to remember it being a category 3, but I wouldn’t stake my life on it. The domiciles built for the military were pretty sturdy and we lived on a hill, so we never really worried about the roof crashing in or being overcome by a flood. When it was over, life continued as normal. There were a few uprooted trees, which at the time I thought was pretty cool, but as it turns out, the worst of the storms didn’t signal the end of time. Later, when we moved back to coastal North Carolina, we encountered the same type of storm once or twice, but afterwards we picked up the pieces and went back to work (or school, as was the case for my brothers and me). While I was at boot camp in Parris Island, South Carolina, Hurricane Andrew (the costliest natural disaster in the U.S. until Katrina) came up the coast caused a bit of a mess, but after it was over… you guessed it… we picked up the pieces and soldiered on. Next to Hurricane Harvey of 2017 was hurricane Katrina which was considered as the hurricane that was costliest recorded till date. 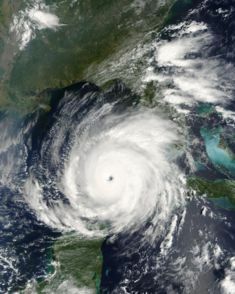 There were total 5 deadliest and costliest hurricane in the United States one of them was a hurricane, Katrina. It hit the parts of Gulfport which is a city in Mississippi leaving the city devastated. Just like trading online like leave traders devastated. Of course, I’ve already documented the plight of my wife’s family after Hurricane Rita hit the gulf coast. As flawed human beings, we have a tendency to look at each crisis as the worst that has ever occurred, and the worst that will ever occur. These storms taught me, and history has confirmed, that we are resilient. We adapt. We find ways to persevere relying on nothing more than the sweat off our backs and the goodwill of our neighbors. Sure, there are tough times ahead, and after this one is over, there will be more we can look forward to. Like a lot of people I’m becoming an Olympic junkie. I have my favorite teams that are either not covered on television or that I want to see live, despite of the time difference. Silverlight also was known as Microsoft Silverlight is an application that is detected which provides a foundation to run and write network applications that have features of the software that run on the desktop. There are plugins that are needed for Silverlight that can be installed which are still present for some web browsers. The present upgraded version of Silverlight gives the support to the developers by providing tools for developing CLI language which helps in running images, animated pictures, and videos as well as multimedia programs. The Silverlight plugin that was introduced earlier helped in only streaming of media files. Silverlight was used in mobile phones that had Windows as a platform for developing this. This was one of the two platforms used for Windows mobile. However, on these mobile phones the webpage that contains Silverlight could not run and neither could they run on Internet Explorer that was present in Windows mobile. The reason behind this was that there was no plugin for Silverlight present in the Internet Explorer. If you wanted to review cryptocurrency trading you had to use a desktop internet explorer. I wasn’t surprised that NBC is using Silverlight to broadcast on MSNBC. OK, I’ll download your plug-in to see what I want to see. It’s from Microsoft, right? It should work fine because they make the FRICK’N OPERATING SYSTEM AND BROWSER. We’ll it doesn’t. I’m not able to see what I’d like to see. However, I am able to watch the 30 second commercials each time I try to bring up the games, which pisses me off even more. Maybe it is a problem with my Internet Connection. However, how come I can see the 30 second spot in all of its bloated ad agency ego glory? Once again Microsoft has proven that they can release products without really testing them. You’d think that they realize they could capture the market and create a brand that would chase out competition due to their roots as the creator of Windows and Internet Explorer. Not so. It seems like Microsoft hasn’t been able to release a trusted version of any of it’s products since the 90’s. With all the anti-trust pressure on them, just making it part of what’s installed on a PC won’t work anymore. Nothing substitutes doing it right the first time. According to eMarketer, as of 2008, 54% of Internet users read at least one blog one time per month, and they project that number to reach 67% by 2012. It is a research company for marketing 93% of subordinate which gives information about perceptions of digital advertising, business as well as media. eMarketer is situated in New York, New York which was established in the year 1996. The companies under fountain 500 are clients of this eMarketer including almost two-thirds of the companies under it. There are 70 countries that have subscribed to eMarketer. In June of 2016, it was obtained by Alex Springer which cost him 242 million dollars. eMarketer will do all the comparisons, organize and study the context of all the information throughout the sources of the globe to provide large-scale mastery in digital trends which are pertaining to publicizing, marketing, trading, and media. eMarketer has a newsletter known as eDaily which is circulated through emails and is free of cost. The newsletter is pursued by more than 120000 people who include professional marketing personnel, senior-level executives, and people who make decisions. The topics covered by the newsletter have sections of latest analysis performed by eMarketer, mobile technology trends, advertising online as well as socially. Please click the following post to read about QProfit Systems. 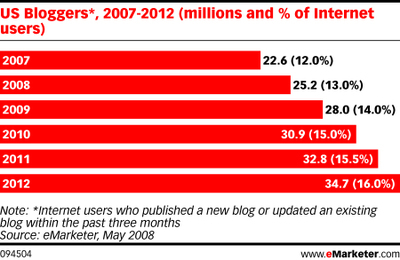 In addition, the number of bloggers will grow steadily between now and then (although the number is still very small). At first glance, this development seems to be very promising to the blogging community, but in reality, it doesn’t tell us much at all. The numbers are likely inflated, because the definition is too broad. 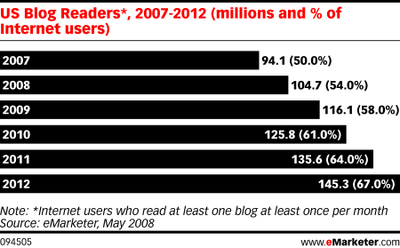 You have to read only one blog post once per month to qualify as a blog reader? You have to update our blog once in the past three months to qualify as a blogger? Reaching to the entire globe is creating a video that goes viral worldwide in no time. This is becoming a new type of entertainment for everyone. Viral videos are nothing but videos that are watched by millions of people when they find it attractive. There is a survey which suggests that each day the YouTube video uploaded are 100 hours. There is also a video on this website, the full details are here. When we encounter brilliance, it is commonly useful to examine the elements of it that make it successful, so that we can also duplicate it. Be platform and website agnostic. Commit to go wherever your consumers are. That means, as in the above example, if your audience is on YouTube, if the content is video, post it on YouTube. The chances of your content being consumed decreases proportionally to how difficult it is to consume. Typically (but not always), this forbids requiring users download extra software to make it work. As a viral campaign, even ElfYourself would have died in its tracks had users not found a ready link to participate. It’s tempting to overdo this. If your content truly is remarkable and compelling, it will spread organically pretty quickly. However, don’t underestimate the time it will take to plant the seeds right. It is critical to first identify the brand or category-specific (or even just the brand or category-friendly) conversations already taking place. Even if it doesn’t fit your predefined notion of who your audience is. For instance, you may be in the underwear category, but if your approach to marketing your underwear really is compelling, let the marketers know about it. Chances are, someone will want to talk about it. I don’t know how they did it, but the above video (minus my head) made one of the morning talk shows, and I have little doubt radio DJs across the country have been touting it, too. Part of this is seeding it where it will be seen, but even that would have been impossible but for the nearly universally compelling content. The term “viral” was not selected by accident. A viral video or campaign, like a virus, is communicable. It infects our consciousness to the point that we feel compelled to pass it on to someone else. JibJab’s effort with Time for Some Campaignin’ here was successful because they incorporated all of the essential principles of making content viral.” It wasn’t easy, and it certainly can’t be considered “free advertising.” However, it’s funny and relevant, but most of all, it’s communicable.